Every season comes with its own dose and form of magic. However, when it comes to true magic, there is no season that can match winter. The holiday spirit intertwined with the anticipation of wedding bells results in a wedding that is almost transcendental in its beauty and mystical glory. Of course, for all of these to become a reality, the future newlyweds need a little more than a festive spirit. There are attire choices to be made, perfect winter food, an amazing band to be scouted (that will play all your favorite songs and help create precious memories on the dance floor), and then there is, of course, perhaps one of the most important elements of all – the perfect venue at which all this magic is to come together. To help you decide among a plethora of different venues, we have done our research to bring you the most magical types of venues for the most special day of your life, and we guarantee you’ll find something that is the embodiment of all your visions and desires. For couples who are tying the knot in Great Britain, and desire to have their dream day at a venue that is as grand as their love, there are very few places that even come close to Wollaton Hall and Deer Park in Nottinghamshire. The impressive architecture and the impeccable stylishness of the inside of the venue will make everyone wish they were getting married just so they could do it here. The surrounding outdoors are so amazing that just by taking a stroll you can imagine all the wedding photos that you’ll cherish for a lifetime, and there is also the Prospect Room set on the top floor of the Wollaton Hall – pure perfection for intimate wedding photography not only because of the interior of the room, but also due to the panoramic view of the Nottingham. As for the décor, this venue follows one of the hottest wedding trends – minimalistic botanical designs, which are equal parts festive and sophisticated. Winter wonderland is wonderful indeed, but there are some couples out there who simply can’t resist their desire to have the best of both worlds – the festive spirit of winter holidays and the perks of a summer wedding. Of course, this isn’t a fantasy – for those who either live in Australia or are considering a destination wedding, having that bohemian beach wedding intertwined with holiday decorations can definitely become a reality. Take your time to explore, and choose just the right beach wedding venue that will cater to all your tastes and preferences, and provide you with the perfect ‘winter magic meets summer glam’ wedding of your dreams. Wedding trends come and go, but there are certain styles that seem to be standing the test of time, and one of them is definitely that of a true (not novelty) rustic wedding. One of the most stunning places you’ll come across in the US is located in Yosemite National Park, CA. 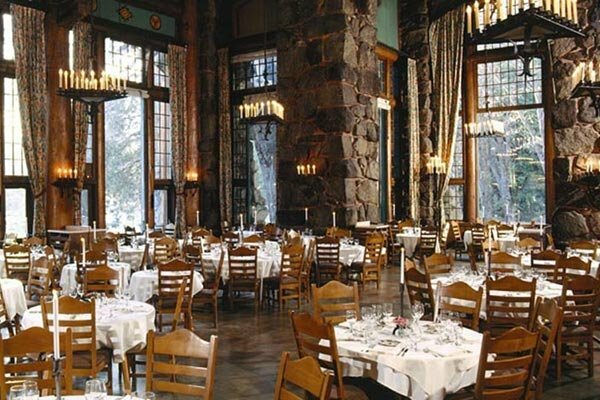 The breathtaking solarium of The Ahwahnee Hotel with its tall windows that provide a majestic view of the Glacier Point should be enough to make you say yes to this place. However, the winning element still has to be the inside of the venue. The luscious drapes, the rustic chairs, millions of candles that look like they’re levitating in the air, the stone walls and of course will make you feel like you’re in a different world as this place is something you would imagine fairytale balls taking place. The additional incentive is, of course, the indoor fountain of local jasper that gives the venue an outdoorsy feel, and the stunning fireplace is bound to dazzle you. Venice is one of the most coveted yet most secluded wedding destinations, so if a private and at the same time extravagant affair is on your mind, this is the place to have it. After all, what is more ostentatious (and magical) than arriving at your wedding venue by boat? One of the absolute finest venues in Venice is, by far, the elegant and luxurious Boscolo Venice. The extravagant and luscious, not to mention colorful and festive in a way that only Italians can be, this venue is custom-made for a couple with exquisite taste and a preference for the finest things in life. The rich interior, the architecture, the food – this place ticks all the boxes for a picture-perfect wedding – full glam style. Here is my short bio in case you need it: Georgia Selih is author @highstylife.com. By nature an artist, by profession a journalist. An irreparable print lover who is enjoying this hot digital affair.